For use with the VecAdapt, this device allows joysticks compatible with the Atari 2600 (which includes joysticks sold for Commodore computers, and other systems (see list below)), to be used with the Vectrex. As these only have one "fire" button instead of the four on the original Vectrex controllers, the add-on can be set to make the Up/Down joystick movements trigger the functions of other Vectrex buttons. Note that this add-on is sold on its own and requires a VecAdapt to work. It can not be plugged into the Vectrex directly. The add-on plugs into the VecAdapt, which connects to the Vectrex. 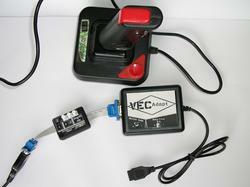 The add-on must be removed in order to use Mega Drive / Genesis controllers with the Vectrex. The right-most of the three buttons protruding from the case (labelled "UP/DOWN TO FIRE") selects whether the Up/Down movements of the joystick should be used normally for Up/Down movement, or should perform the functions of other Vectrex buttons. For example, in Minestorm the Up direction can be set to trigger the button for "Thrust", while Down can trigger "Warp", with the button on the joystick used for "Fire". The other settings are for the function assigned to the fire button on the joystick, and the Up-Down directions if "UP/DOWN TO FIRE" is pressed-in. The middle button selects whether the joystick fire button performs the function of Vectrex button 4 or 3 (if "Button Swap" is enabled on the VecAdapt, this will actually select between button 1 or 2). The function of Up when "UP/DOWN TO FIRE" is pressed-in is the opposite of the function assigned to the joystick fire button (so if the joystick button triggers button 4, Up will trigger button 3). The left-most button sets the function of the Down position when "UP/DOWN TO FIRE" is pressed-in, either to button 2 or 1. The function of Up or Down when "UP/DOWN TO FIRE" is pressed-in is shown on the label as the number in a box. So with all of the setting buttons pressed-in, and button-swap disabled on the VecAdapt, the joystick's "Fire" button will function as Vectrex button 3, Up will be button 4, and Down will be button 2. Left and Right will always work as normal. Wikipedia. Paddles, mice etc. will not work with the add-on. 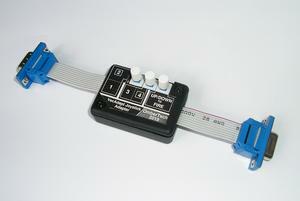 Ideally try to find a joystick built with "clicky" microswitches, for a more arcade-y feel.